All inclusive Agadir holidays are full of Moroccan mystery. Agadir is a city on the southern region of Morocco and enjoys Mediterranean like weather with an average annual temperature of 19 degrees. 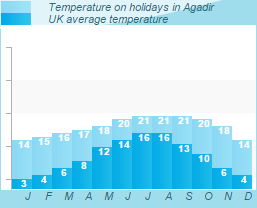 The temperature can rise to about 28 degrees in the summer months on all inclusive Agadir holidays. Suitable for: The idyllic explorer. Beach: The bay of Agadir, a blue flag beach with disabled facilities. Extra Info: Not to be missed is the cammel ride. The largest beach and the focal point of Agadir holidays is the 18 kilometre long Taghazout with its longs and stretch full of activities such as jet skiing, windsurfing, horse and camel rides and quad bilking along the coast. There is a tourist train that also travels along the coast which is perfect for travelling up and down Taghazout’s extensive shore on Agadir holidays. The beach is sheltered from strong sea breezes and beach police patrols are commonly seen to ensure your safety around the area. There are also plenty of tourist friendly cafes and sun loungers to snap up on early morning excursions. Quads can also be taken up to the High Atlas Mountains for a thrilling journey along its dirt tracks while less adventurous types can stay in the main city and browse among the shops. All inclusive holidays are in a mecca for pottery, jewellery and leather and copperware stores so it is always worth spending a day around them perhaps after a trip to the beach or before your evening meal. Look out for coopartim which are government regulated stores selling local crafts at fixed prices. All inclusive Agadir holidays are choice for bird watching at Oued Souss Estuary which is part of Souss-National Park. This is fantastic day out for families where kids can learn about Morocco’s unusual wildlife.